2012 President’s Cup Takes Place – Just! I think a huge round of applause and thanks is due to all those who eventually managed to make it happen, not least the very special people who set up the lawns, who provided us with such excellent lunches on both days (18 and 19 August) and also those were able to stay away from bugs and things both before and during! Hopefully it may make entertaining reading for those of you who were not present over the whole or even part of the weekend to view the sequence of events that evolved from around 3 pm on Friday 17 August. Friday approx 3.10 pm :- On my way home, but in the car on Frome bypass. This time I heard it was Kevin Carter and agreed to call back when I got home. Friday approx 3.15 pm :- Kevin regrets that he’s not responding to antibiotics after succumbing to an infection and therefore will not be able to manage the tournament. He couldn’t get hold of Daniel Mills (tournament secretary), because he’s gone away – we know not where! “Could I do it instead?” Of course, no problem! Four entries in the Super-B, four in the B level. All in each group play each other twice, three games per day; very easy, very comfortable!! Friday evening, not far short of midnight :- Manager’s announcements produced and printed off, together with the order of play for six rounds, covering the whole of the tournament for Saturday and Sunday. Saturday morning 9.15 am :- Kathy (Wallace) enquires as to whether I know about Geoff (Hughes)? No, I do not! “Well, he’s got an ear infection and will not be coming to play! He tried to contact Daniel but the message may not have got through!” “Damn and blast” but somewhat stronger. Tear up the orders of play. Players now down to 7. I was mightily relieved to hear that the B Level contingent (or at least some of them) were now recommending a single block as the sensible way out, a la a flexible Swiss. Saturday evening 6.15 pm :- Kathy appreciates that her handicap of 8 puts her out of the same league as the rest of the Magnificent Seven and that it would make my job that much easier if there were an even number of players on Sunday. She would therefore not be turning out the following day!! I can readily understand her point of view and I reluctantly accept her decision. Sunday morning 9.30 am :- Play resumes, but no Derek Knight. Maybe he’s overslept or thinks that play is not due to start until 10 am? Sunday 9.45 am :- Perhaps I should check my mobile to see if Derek has left a message. No message from Derek, but yes from Kevin Carter! Sadly, Derek’s wife has been taken ill overnight and so he won’t be able to continue in the tournament on Day 2. Come back Kathy, all is forgiven! Fortunately, Paul Francis our lawns manager is still around and is happy to play a friendly, even though his handicap of 10 is outside the advertised tournament range. Play continues. Sunday approx 12.30 pm :- Another excellent lunch of poached salmon with hollandaise sauce, this time courtesy of Mo Bell. Of the five remaining competitors, the three from foreign parts (Shropshire, Uruguay and North Harrow) declared that their interest in gaining the President’s Cup had long ceased and would therefore be taking their leave. 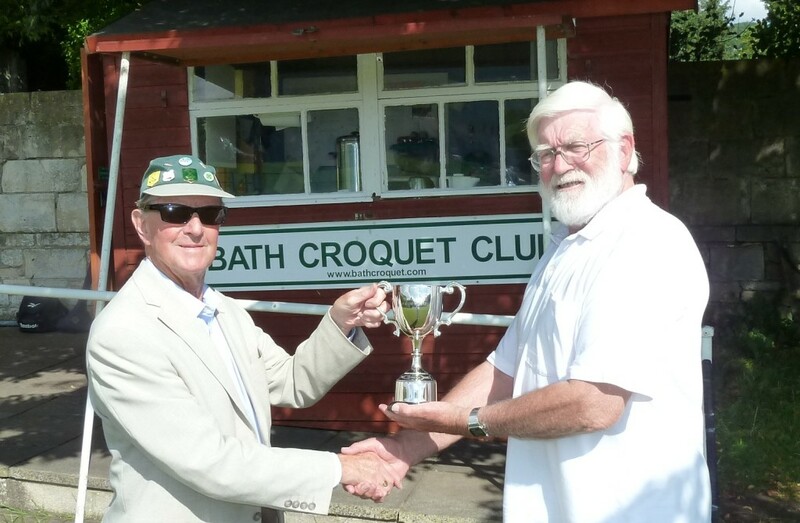 Only two remained to fight it out, in the company of the donor of the trophy and former President of Bath Croquet Club himself, Mr. Bob Whitaker; who kindly presented the President’s Cup to the eventual winner. Has there ever been an occasion in the past when 45% of original entrants in a CA tournament were not present at its end?? >Who was there at the not bitter end? Dave Richards of Nailsea and, of course, the manager – well he had to be there! Just in case you’re wondering what happened in the end and who went home with the trophy? Modestly, I have to tell you that it was the manager! Thank you again to all of you, for participating – or nearly participating in a Bath tournament and for being so wonderfully accommodating at the unique(?) turn of events that befell it. How about signing up again for next year, when surely the same cannot happen again!